#Worlds Most Luxurious Ship Launches today!! See the Worlds Most Luxurious Ship in Monte Carlo..... be sure to watch the Christening! MOST LUXURIOUS Cruise Ship in the World Launces today! LUXURIOUS! This describes the NEWEST Cruise ship in the WORLD! If you are in Monte Carlo TODAY July 13th be sure to watch the Christening of the worlds most LUXURIOUS SHIP!! Why I love sailing on Regent Seven Seas!! Once you have paid your cruise fare there is literally NOTHING else you have to pay for!! Aside from shopping in the onboard lovely gift shops or going to the spa, there truly is NOTHING else you have to pay for….it is all included. Unlimited Shore Excurions, Flights (often in Business Class) or a small supplement to upgrade to Business Class, drinks of every kind… if you have ever been annoyed by having to pull out your room key to buy a bottle of water as you are leaving for a shore excursion, then you should travel on Regent!! When travelling on the Grand Voyages they even pay to have your suitcases shipped so you don’t have to bother with dragging luggage around. When it is time for a shore excursion there are mountains of water bottles, towels, umbrellas by the off ramp so you can take what you need when you go ashore. Regent is the BEST way to cruise and see the world!! Here is more about the new EXPLORER that I CANT WAIT TO EXPERIENCE!! She is sleek. She is elegant. She is the world’s most luxurious ship. She is staffed by a crew that takes great pride in pampering guests with impeccable service and that anticipates your every wish – and she is finally here. 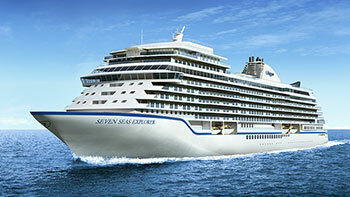 Seven Seas Explorer® boasts one of the highest space ratios ever seen in the cruise industry, the largest suite balconies at sea, and the exclusive top-of-the-ship residence with a private in-suite spa – all of this in addition to Regent Seven Seas Cruises’ generous all-inclusive offerings of air, tours, transfers, meals, WiFi, and more. She will be sailing the azure waters of the glamorous Mediterranean Sea for her inaugural season before she rings in the New Year in Miami. Seven Seas Explorer® is the new reason to travel.